In the reference read above, the Commissioner of School Education, A.P., has stated that in Andhra Pradesh State, English Medium is available in the Private schools, and Residential Schools managed by Welfare Societies at the primary level. By and large all Government, MPP, Aided schools have only Telugu Medium at Primary School level. It is often opined by teachers and other stakeholders that there is a declining enrolment trend in Government Schools. And almost all Private Schools provide English Medium at Primary level. Parents of poor children incur enormous cost in enrolling their wards in Private schools for providing English Medium education. During the State wide consultations held on New Education Policy in the year 2015-16, the feedback was to have only Mother tongue based medium at primary level. However, there is a growing demand from parents and some Teachers for establishment of English Medium schools. It is also clear from the trend of higher enrolment of children in private English Medium schools compared to Government schools at primary level. It is also a fact that Government managed Secondary schools have higher enrolments in view of parallel English Medium being available. Government Aided Private schools have started unaided English Medium sections to successfully arrest the declining enrolments in their schools. A recent trend of increasing enrolment in Municipal Primary schools is also noticed in view of introduction of English Medium in Municipal Primary Schools. Parallel English Medium shall be started in Model Primary and Primary Schools by opening of Class I from the academic year 2018-19 and gradually increasing each further class upto Class V from the next consequent academic years. Gram Panchayat and School Management Committee resolutions would be essential for starting parallel medium of instructions in English medium without diluting the ongoing telugu medium of teaching. A second set of trained teachers shall be provided for teaching English Medium sections in all those schools without compromising the periods and teachers allocated for telugu medium teaching subject to fulfilling the rationalizing norms. Declaration of the Headmaster should be obtained that they would facilitate teaching primary classes in English medium from the Academic Year 2018-19 onwards. They should also obtain declaration of those teachers willing to undertake this method of teaching to undergo the required English proficiency test, relevant training (Online and offline) for acquiring skills for teaching in English Medium, in preparation for introduction of English Medium in their schools. There should be adequate infrastructure facilities with additional classrooms to introduce English Medium and adequate land/site with scope for construction of additional class rooms in future, if required. A comprehensive recommendation of the District Educational Officer in the prescribed Proforma to be obtained online by 31.10.2017.7.50% of Vacancies should be earmarked for recruiting English Medium Teachers, who have studied in English Medium at least up to Graduation level in future Teacher Recruitment. Advance enrolment drive for English Medium admissions are to be conducted in all such schools to prepare indents for text books, assess infrastructure needs depending on the class wise enrolment in such schools in Class – 1 to V.
The Director, SCERT should take necessary action for conducting the proficiency test to the willing teachers, assess the current levels of English teaching skills, design and implement appropriate skill training program between October 2017- February 2018. After careful examination of the matter and keeping in view of the emerging demand for English Medium education, Govt. 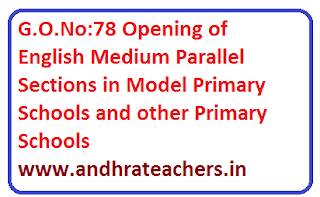 hereby accord permission to the Commissioner of School Education, A.P., Amaravati for opening of English Medium Parallel Sections in Primary Schools from the Academic Year 2018-19, subject to the conditions mentioned above.